Melt oil in large nonstick skillet on medium heat. Add egg mixture; cook and stir until eggs are firm. 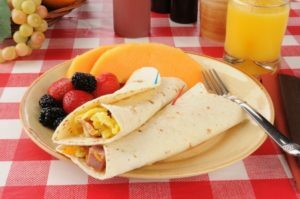 Spoon egg mixture into warmed flour tortillas. Top each with 1/4 cup shredded cheese. Fold into burritos to serve.